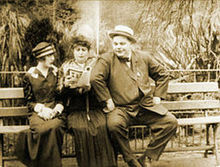 This Keystone comedy stars Roscoe “Fatty” Arbuckle along with frequent co-star Mabel Normand and returns to the typical theme of the “park” comedy the so frequently did. In this case, the movie is shot in San Francisco, seemingly in Golden Gate Park near the Conservatory of Flowers, and at least gives us some different backgrounds from the many comedies they performed in LA. 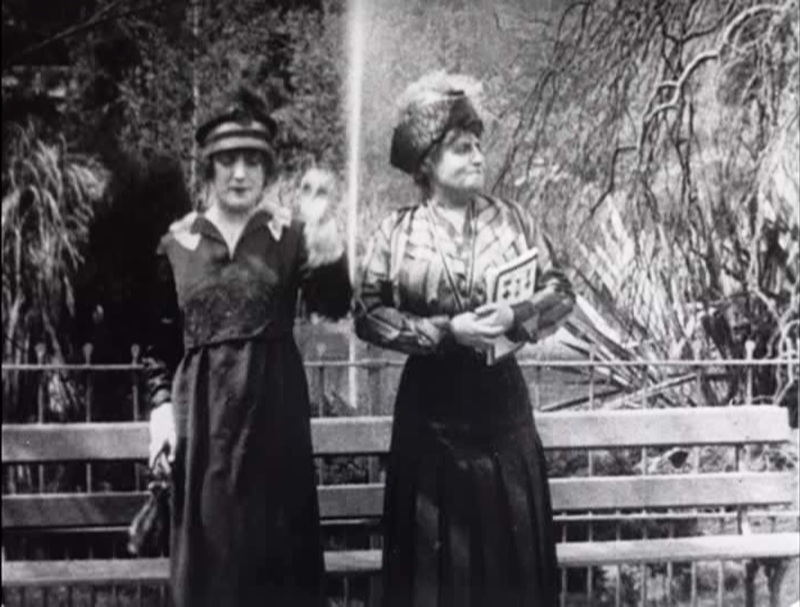 As the movie opens, Mabel is in the park with her mother, Alice Davenport, and the two of them stop to look at a fountain. Mabel’s mother wants to read her magazine, and Mabel spots Fatty, her sweetheart, standing nearby. She invites him over to meet mother, who positions herself between them until Fatty uses his bulk to shove her over. They shyly attempt to kiss, but mother keeps looking at them and stopping them, and ultimately they decide to go for a walk while mother reads. The action switches to a man (Joe Bordeaux) sleeping on a park bench and a large cop (Edgar Kennedy) who walks up and rousts him. After the snoozer has departed, Kennedy lies down for a nap himself. Joe spots Alice alone and sits down next to her, pretending to have found something interesting in the paper. While she’s distracted by the paper, Joe snips the ribbon holding on to her watch, and steals it. He runs off and into a plainclothes policeman (Glen Cavender), who checks to see if his own watch has been stolen. Since it hasn’t, he lets Joe go. Alice now realizes that her watch is missing and hollers for a cop, waking Edgar from his nap. He runs over, gets all the information, and rushes off in search of Joe…until he gets back to his comfy bench, where he lies down for another forty winks. Alice goes off in search of her daughter. Mabel and Fatty have found a sylvan glen in which to frolic together, but suddenly a bee lands on her nose. Fatty laughs at how funny she looks as she crosses her eyes to try to see it, but then realizes she could be stung and tries to be a hero. He carefully positions himself and flicks it off her nose, and right onto the lip of another man (Ted Edwards) sitting on a nearby bench! Fatty also laughs at him for a while before flicking it off again. During his absence, Joe spots Mabel and tries to move in, losing the stolen watch through a hole in his pocket in the process. She resists his advances, and soon Fatty comes back over and chases him off. Joe crashes into the bench with Ted on it and they both go over. Now, Fatty spots the watch, and gives it to Mabel as a present. She’s thrilled, perhaps because it’s just like the one her mother wears. He goes to a nearby kiosk to buy some sweets for her. Joe dusts himself off and realizes he’s lost the watch, and backtracks to find it, running into Mabel again. He recognizes the watch he stole and takes it away from her. Now Fatty comes over and starts fighting with him. Alice sees them and she recognizes her watch, and the chaos escalates. Finally, Edgar, rousted from his snooze by his police chief, arrives on the scene and gives the watch to Alice and chases Joe. Joe tries to escape by climbing through a hole in a rock, but Edgar walks around to the other side and conks him with his Billy club. Although the plot here is simple and typical, a bit more went into this one-reeler than was usually the case. 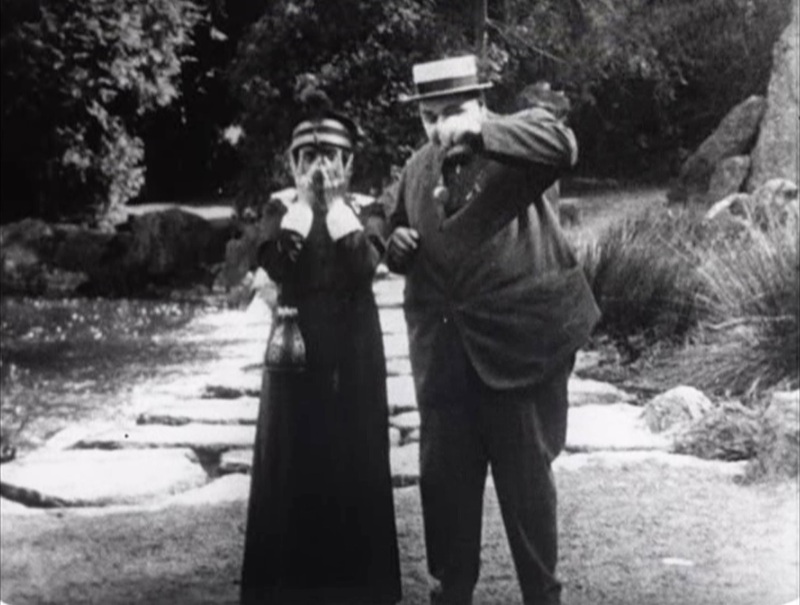 There’s obvious care in positioning the camera to take advantage of the setting – locations include the fountain, a building that I think is the Conservatory of Flowers, a tunnel, and the glen where Fatty and Mabel meet the bee. There are few, if any, “generic” shots as we see in many of the LA park comedies. There are also some good close-ups, including the theft of the watch and Mabel’s face with the bee on it. This is one of those movies where sources dispute the directorship – Wikipedia gives it to Mabel, while imdb and “The Silent Era” both claim Arbuckle. I’m inclined to believe it was him, but perhaps the duties were split because of the fast work needed for a location shoot. This movie included commentary on the “Forgotten Films of Roscoe ‘Fatty’ Arbuckle” disc, and it’s an example of what I said about poor preparation for the commentary tracks. One of the commenters tries to lead the other into identifying the location by saying, “So, that’s some big park in San Francisco, eh?” and the other fails to pick it up. Those of the audience who have never been to Golden Gate are left in the dark, although the location is pretty obvious, even a hundred years later. A little rehearsal or pre-writing before recording the track could have fixed this problem.